Give your own or a loved one's dining table a special makeover with a set of photo placemats custom designed by you. Available in two sizes, the personalised placemats are perfect for all the family or used to create a gorgeous table setting for dinner parties. High definition and super glossy, your photos, text or design will make any table come to life. Make your own photo placemats to give your dining table a new lease of life or design photo tablemats as a unique gift for friends and family. The product is amazing just got to put them through the rigours of home life now. But I think the more you buy the more discount you could offer. The quality is excellent and cannot be faulty, if you have photographs you want to show off you can't go wrong with these. Personalised children’s placemats make a great gift and are a fun way to help encourage those fussy eaters. This size is ideal for your kid’s placemat. These placemats are larger than usual, perfect for when you’re serving up a hearty roast or a help-yourself one-pot dish to the table. For the big appetites in your family, these large photo placemats will easily support generous size dishes and plates. Care: Easy clean gloss surface, wipe clean with damp cloth. Not dishwasher safe. What Will My Personalised Tablemats Actually Look Like? Obviously, they’ll look amazing! Your photo or design is printed edge-to-edge for a clean, attractive finish, and the glossy surface reflects the light so well. Being a non-porous surface, the photo tablemats are incredibly smooth. The back is dark hardwood and made more hygienic as we don’t use cork or baize that can leave fibres on your dining table. Who Will Love Personalised Placemats UK? Kids will love their own tablemats personalised with their name and photo, and you can even create a bespoke one for their birthday party or Christmas to make them feel extra special. For friends who are moving house, give them a beautiful bespoke set of photo placemats so they can have their first meal in the new house with a bit of added luxury. So make your own placemats and coasters today and create unique table settings. Your personalised tablemats are all handmade to order individually, so you can print a different photo on each mat if you wish. We print your own photos using a specialist process to guarantee a long-lasting print and high-quality every time. Everything is handmade by our passionate team of printing experts here in London, UK. Your photo or design is printed edge-to-edge, but you can include a stylish border to complement your existing tableware and home décor. Simply adjust the image size, choose a background colour and your personalised tablemats will have a nice, attractive border. Add text over your images to write a special message or name of the recipient. 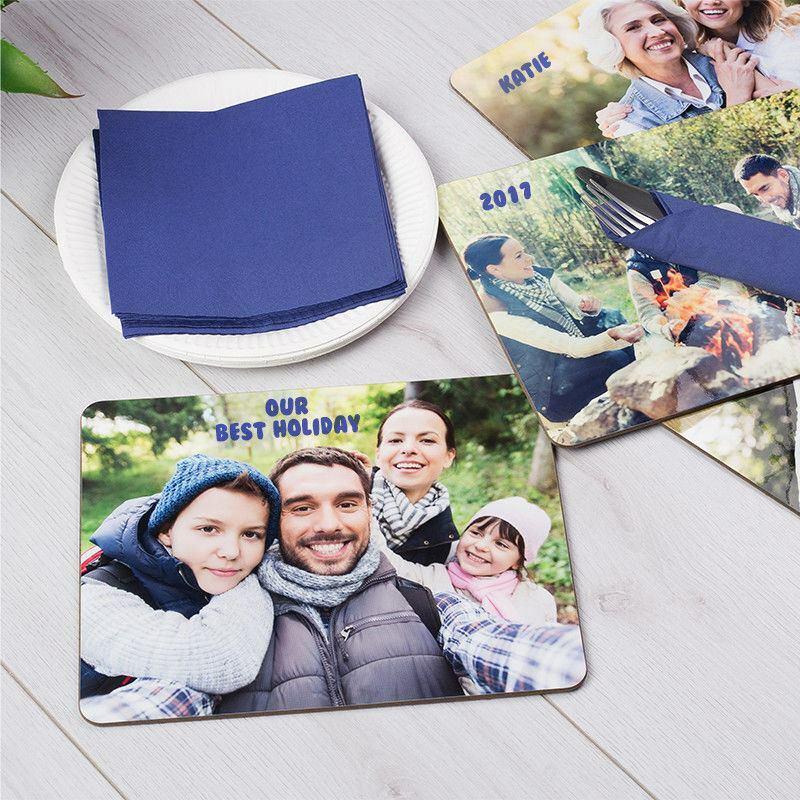 A great gift for families, everyone can have their own individual placemat printed with their photo, or take name placeholders to the next level and give your dinner party or special event guests custom placemats. Your designs will be admired around the table. Children’s personalised placemats with names are a great way to make eating at the table fun and exciting. Print their favourite cartoon, Disney character or pop singer onto their personalised placemats and turn teatime tantrums into big supper smiles! Can’t choose one photo or design? Print photo collage placemats and include all your favourite snaps. Our online design system creates the collage for you, and there’s a choice of collage styles. Photo collage placemats, printed with your special memories, make a wonderful gift for a friend or loved one.